For years, I’ve been trading books online using PaperBackSwap. It’s such a wonderful service that’s fueled a lot of my reading over the past five years or so. When I first signed up for the service, I swapped a ton of books. I went through my shelves, packaged up several dozen books that I knew I wouldn’t read again, and shipped them out (it really didn’t cost much to ship them). In exchange, a trickle of books started arriving in my mailbox. Books that I actually wanted to read. Books I’d wanted to read for a long time, like A Summons to Memphis and American Pastoral. Books I wanted to read to my children. In other words, it was a great deal. You sign up for an account on PaperBackSwap. When you sign up, you’re asked to list ten books that you own that you’d be willing to trade by mail. When you do that, you get two “credits.” You can use a single “credit” to request that any of the five million (or so) books listed on PaperBackSwap by other members of the site be sent to you. So, how do you get more credits? You list more books. If someone on the site requests one of the books you’ve listed, you just print out a mailing form (provided to you by the site), wrap that form around the book (perhaps with a bit of additional wrapping), tape it up, and mail it. When the other person receives your book, you get another credit. Shipping the book (via media mail) costs about $2. So, in essence, for $2, you get a book of your choice mailed to you (and also pass on one of your unread books to someone who will enjoy it). In my eyes, that’s an exceptional deal. Of course, I’m a heavy reader, so having a flow of fresh books is a very good thing. Let’s say you don’t enjoy reading, though. SwapACD does essentially the same thing for music CDs. SwapADVD (which I’ve used a fair amount) does essentially the same thing for films. In each case, you mail out your own items using media mail for about $2 apiece and then eventually receive replacements (things you want to read or watch or listen to) in the mail for free. 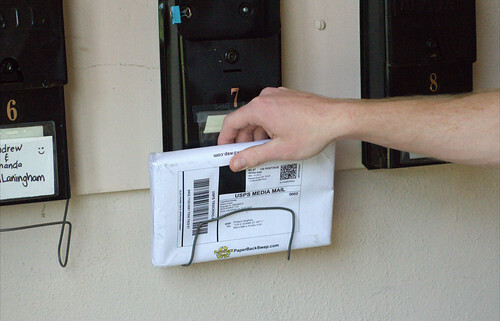 Trading media by mail is a great convenient way to refresh your book, DVD, or CD collection at a very low price. Give it a try!